I've painted for a chunk of time today - feels really good to focus for several hours instead of a little here and there. 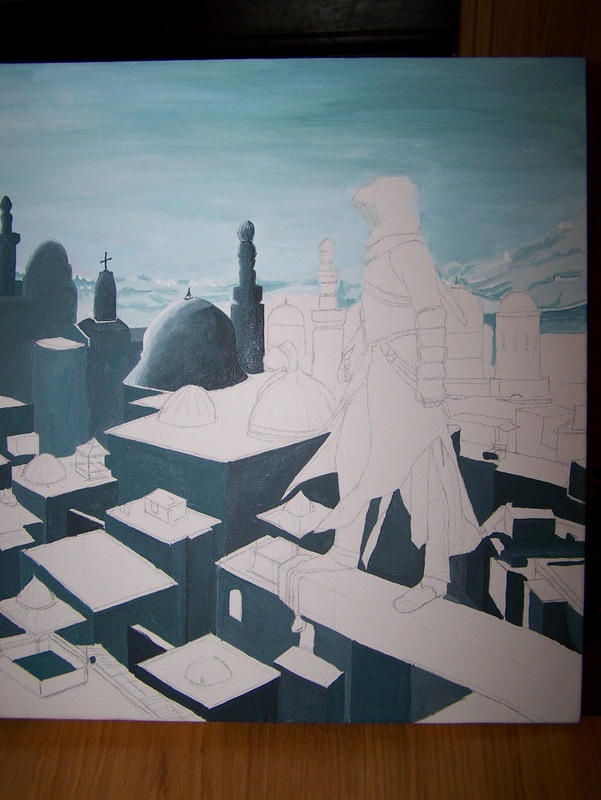 I've done some more blocking in of the buildings, I think in a couple more hours I'l be ready to start on the detail. 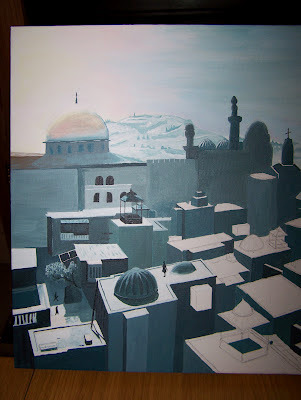 You may spot that I did start some detail - I got a bit fed up of swathes of colour, and couldn't resist a bit of detail! I'll be doing some more in the morning. I've a feeling this may take some time - the part I've done this morning has taken me 1 3/4 hours to paint! Well, its been a while since I posted - illness and PC issues got in the way of painting and then posting about painting! I decided to buy www.canvasandpaints.co.uk but migrating to it has proved more than I'm currently capable of - I've tried, only to lose the contents completely. I'm going to try again, I think I just missed several crucial stages out in the process. I've found a tutorial, so I'll be trying again pretty soon. 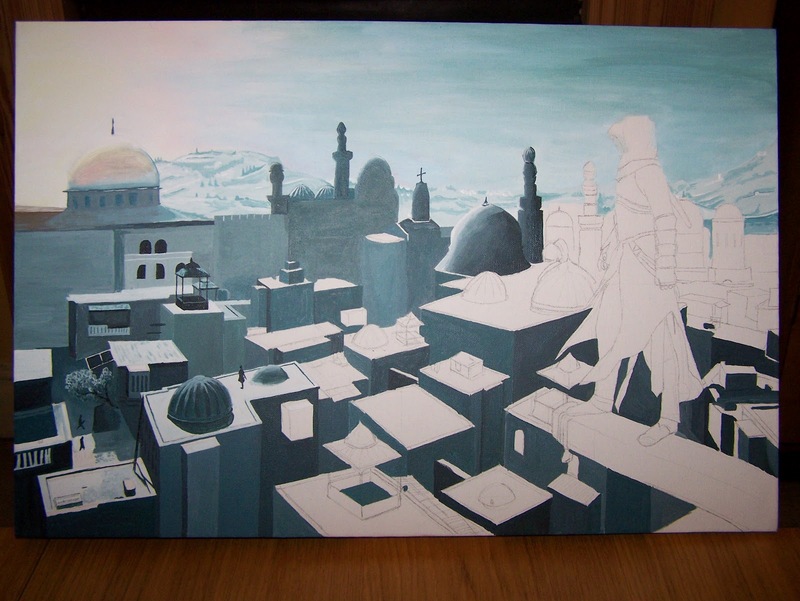 Anyway, back to Assassin's Creed. I've started the buildings, I think they're going to take quite a while, as they are all quite detailed. I've started off by blocking in the walls and some roofs, I'm planning to do that for all of them, leaving the detail until later. 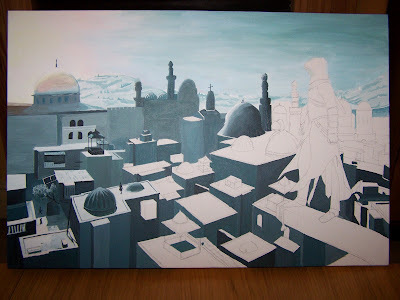 I'll also be colour-washing in a greyish-white to reproduce the haze from the sun. I'll be doing some more tomorrow, in the mean time, if anyone has any advice about moving the site, feel free to email me at canvasandpaints@gmail.com thanks! I've re-done the sky, and am much happier with the colour now. Buildings next! I'll probably end up doing a white colour wash over everything, to try to emulate the effect of the sun, so I'm not too worried its all looking a bit sharp right now!